A man walks through the Judean Desert. Disheveled. Visibly shaken. Pondering events he’s experienced. He comes to a town and the home of an innkeeper. He sits down with the innkeeper and gives him an account of what he’s been through. This man is Clavius. A powerful Roman Tribune whose soul has been hardened by years of doing the bloody, dirty work Pontius Pilate commands him to do. Especially overseeing the crucifixion death of prisoners. Pilate tells Clavius he wants to avoid a situation, the aftermath of an event he ordered done while Clavius was away fighting. The event? “I had to crucify him,” Pilate says nonchalantly. The execution of a man named Yeshua, one who claimed to be the Messiah and said He would rise again after death. Wanting to be sure no one stole the body, Pilate gives Clavius the task of placing the tomb of Yeshua under guard and sealing it. When all goes awry at the tomb and the body of Yeshua is missing, Pilate orders Clavius to hunt down the missing body to disprove the rumors of a risen Messiah and prevent an uprising in Jerusalem. Clavius begins to question those who might have information about the whereabouts of Yeshua’s body. And he also questions Yeshua’s followers. He’s clearly searching for the truth. Clavius follows Mary Magdalene to the upper room where the disciples have gathered. 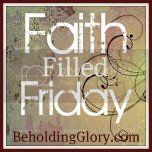 A crisis of faith occurs: he cannot believe his eyes. He encounters the living, breathing, bodily presence of Yeshua. He joins the disciples. Later, he is also an eye witness with the disciples as Yeshua ascends into heaven. As the disciples part ways to go spread the Good News and fish for souls, Peter asks Clavius, “Will you fish, too, Clavius?” Clavius ponders the thought. Back in Rome, after hearing the news that Clavius has followed “that Hebrew,” Pilate gives up his pursuit and decides that he will never see the disciples again. Aren’t we the Claviuses of this world? Don’t we all wander the desert at some time in our lives as unbelievers…confused, overwhelmed? Searching for the truth of the man Yeshua, the Son of the Living God? Have you had that crisis of faith, going through the desert of decision? Have you encountered the Living, breathing, presence of Yeshua? Have you found your way in the New Life? Are you now fishing for men? I. Believe! I. Can. Never. Be. The. Same! ***From the movie Risen! If you have not seen it, watch it! A wonderful movie.